Wild Geranium is a member of the Geranium Family. It grows to 18 inches in height and has green leaves with 5 deeply cut lobes which grow to 1.5 inches in width. It typically grows in rich soil in pine forests at elevations between 5000 and 9000 feet. Wild Geranium produces a seed pod that is shaped like a Crane's Bill (which is another name for this plant). 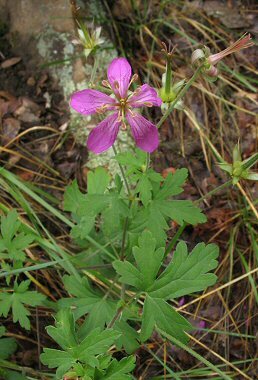 Wild Geranium blooms between May and September and produces a pink flower with 5 flared petals which are about 0.5 inches in width.